Holla My Friends!! How are we all this week?? Can you believe it no new fabric again this week....I know something is very wrong with the Universe?? But I did get some sewing done...Yay...after I had a wee freak out that my Possum Magic border #2 was due to be posted and I wasn't finished... Thankfully I have Wendy who is all things sane and she emailed to say it's not until the 29th!! Seriously how do I get dressed in the morning?? Alice's first border is just gorgeous and soft, and she included some very special fabric in the hexagons...I'll say it again, Quilty people are the best!! Once I got over the heart palpitations of being late I resisted the urge to start a new Quilt......aaaaaaanndd did my Bee Blocks instead. Such a good Girl. 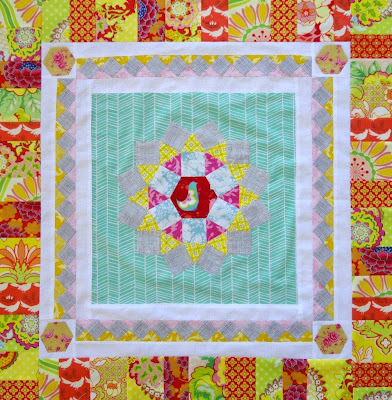 The Compass Quilters Queen Bee for September is Nesta and she requested some cross stitch blocks using this tutorial, in Orange, Pink and Lemon. Some of my favourite Sherbety colours! Tell me ...Is it just me? Everytime it seems I make a block for someone else I am suddenly overcome with the need want to have a quilt of my own using the same block?? What is up with that??!! I don't know where she gets this type of behaviour from...really who's her mother! I am happy to be taunted and teased if this is the result! I too have thought both your blocks and Nesta's blocks would be such fun as whole quilts. Even if it is just the colours. Focus. I need to focus and finish stuff first! With you there, most times when I do a block for someone I want some for me grrrr, as if I do not have enough on the go already. Love Nesta's blocks I have a heap of fabric ready to cut, was hard to choose, which pinks, oranges, yellows. Okay, I'm gonna allow this link-up simply because you are showing off such bright, bold and beautiful fabric in your projects! ;-) ;-) ;-) Those cross stitch blocks really do make you want to have your own! All your sewing looks great. I love those cross-stitch blocks! I also have the same need to have some pretty cross-sitch blocks too.